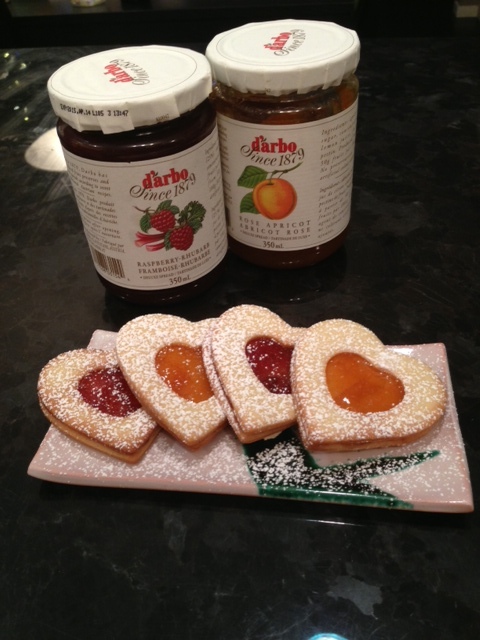 Heart Cookies | So Hungary! This recipe is from my Grandma Lisy, and has been a Welsh Christmas staple for as long as I can remember. We have only ever made these at Christmas, but I think the only reason is because they are a little bit time consuming (time to let the dough sit and roll out/cut the cookies). These cookies are excellent with raspberry, strawberry or apricot jam in the middle (lemon curd is delicious too) and seem to be the perfect dessert after a heavy Christmas dinner with a hot cup of tea. These cookies are very simple, light, and even if you only make them at Christmas time, they are well worth the effort. Cream the butter, sugar and eggs together. Once this is nicely combined, add the vanilla, then slowly combine the flour. Once the dough is combined, roll it into a ball and place it in the fridge for at least 1 hour. You can also refrigerate the dough overnight. I would encourage you to let this sit overnight if you can because it will make your life easier when you go to roll them out. When you are ready to roll out the dough, divide it in two and leave one portion in the fridge. Preheat the oven to 350 C. Using a well floured board and rolling pin, roll out the dough until it is about 1-2 mm thick (it should be nice and thin). Using a medium heart shaped cookie cutter, cut out as many hearts as possible, and put them on a cookie sheet. Put the cookies in the oven for 10 minutes or until the edges of the cookies start to turn brown (check them periodically to make sure they don’t go too dark). While the cookies are in the oven, place all of the leftover dough back in the fridge, and take out the other portion of dough. Roll this portion out and use the same cookie cutter to cut out the heart cookies. Before placing this batch on a tray to cook, use the small heart cookie cutter to cut a heart shaped hole in the center of the hearts you just cut out (see picture to get an idea of the size of the cutters and thickness of the cookies). Place these “tops” on the tray and cook them for approximately 10 minutes (again, making sure to check that they don’t get too dark). Re-combine all of the dough and place it in the fridge. Take out the piece that is in the fridge and repeat. Make sure that you make the same number of tops as bottoms and keep going until all of the dough is gone. Once the cookies are out of the oven, put them on a rack to cool for 10 minutes. They are then ready to assemble or freeze as is. Putting the cookies together is pretty simple, place a small bit of jam on the bottom cookie, and place the other half of the cookie on top (like a jam sandwich!). I like to make a variety of cookies, put them on a big plate and finish them off by sprinkling them with icing sugar. They are then ready to enjoy! These cookies are considered a tradition in our family and I think you will find that if you start making these, they might become a tradition for your family too. Enjoy!